Happy Thursday! Leopard is just one of my favorite prints. I think I must have that got that love from my grandmother. Since the day I was born, my Nana has been wearing leopard. She had pillows, blankets, and most of her purses were leopard. This love is now passed on to me and I am addicted just like her! 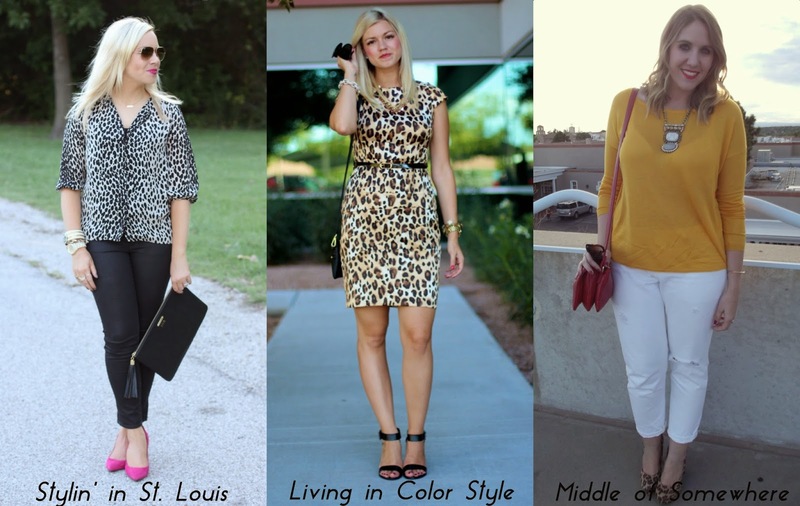 Come share your leopard looks with Elle and I! 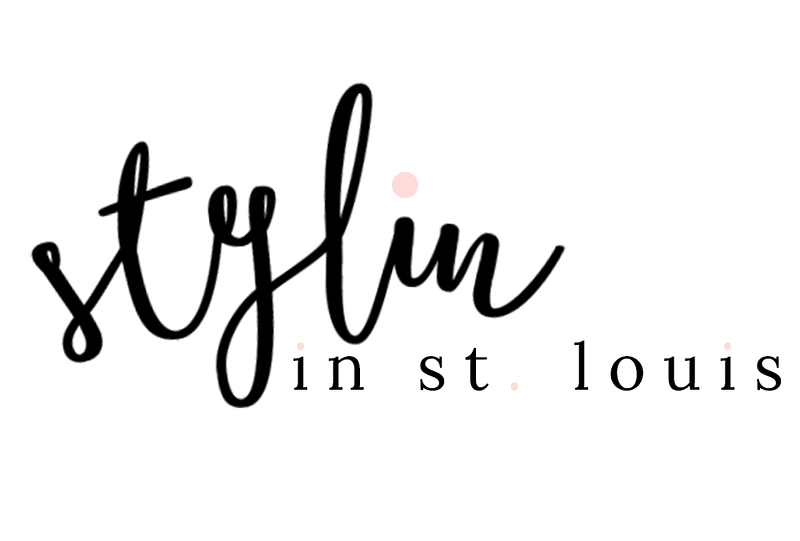 Spotlight: Our spotlight of the week is Erica of Casually Styled. Erica look dynamite in this fabulous transitional look! We love how she styled her overalls with leather! Such a fabulous combination! She really knows how to rock fall transitions! Be sure to check her blog! 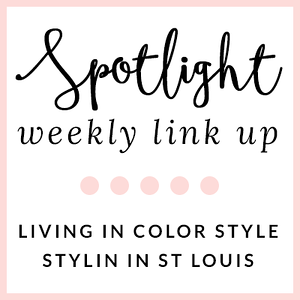 Nextweek: Next week our spotlight weekly theme is NEUTRALS. Thanks for linking up! See you next week! I love leopard as well, this blouse is adorable. You look very feminine and chic in leopard and the pop of color with the shoes is perfection. Love your leopard blouse and the pop of pink! Such a chic look! Love leopard! So fun that you share that in common with your grandmother! It easily goes with so much or can stand on its own without overpowering. Adorable outfit! I am in love with leopard, too! I love this blouse. I really need to get a leopard scarf still, I am probably the last person to get one. ;) I also love your pink lip color and heels! Youre rockin the leopard and I am dying over those pink heels!! So cute! Great blouse, babe! Love it. :) Happy Thursday! Thank you so much for choosing me as spotlight of the week! I absolutely appreciate the feature!! Love today's look! Those hot pink heels are gorgeous! I love this top! Those heels are the perfect choice. What a fun way to add some color. Your rings are so awesome. Loving those. I have two recent posts for this which clearly means I LOVE leopard, ha! Leop, black & pink....one combo that's unexpected but so awesome!!! And your arm candy is fantastic!!! Such a cute look! I love how you added a fun pop of pink with those awesome shoes! love the leopard with that shade of pink! Ohhh..love this look. The pink is the perfect touch! I am hosting my first link up and would love for you to join me. i love the bright pop of color with your heels and lipstick! I love that you chose Leopard this time. I love it all year-round, but especially in the Fall. Your blouse is beautiful and you styled it quite well. I am loving the bracelets. I linked up some cobalt leopard - come take a peek. Have a great weekend hun. <3 Ada. love the animal print with the pop of pink!! Love the edginess of the leopard print paired with the femininity of the pink heels! Great look! Love the pop of pink with the leopard, gorgeous as always! I always love leopard! That blouse is fabulous. Such a classic piece! Cool look, I love Leo print!!! Love your gorgeous pink lips!! And that leopard top is amazing! I adore leopard print as well, and totally believe it's a neutral! Love your pink lips and pumps paired with your leopard blouse. Thanks for hosting!